3It was the first capital city of the island and today it counts about 2.500 residents. The houses here are built so close to each other that they create very narrow streets which is traditional architecture of most Greek islands. You can find a traditional windmill and just next to the main village you can see the ruins of the old castle. The cave known as “Aspri Tripa” (White Hole) in mountain Zini has findings from the Neolithic period and of more recent times. In a 1 km distance you will find Kamari, with a small port which provides services for small boats during the summer. In Kamari area you can see the Early Christian basilica of Agios Stefanos, back from the 5th century, and admire the preserved parts of the mosaic decoration along with other remaining. In a short distance, across the basilica quite close to the coast, is the small island of Kastri with the small church of Agios Nicolaos where you can go with pedal boats or by swimming. 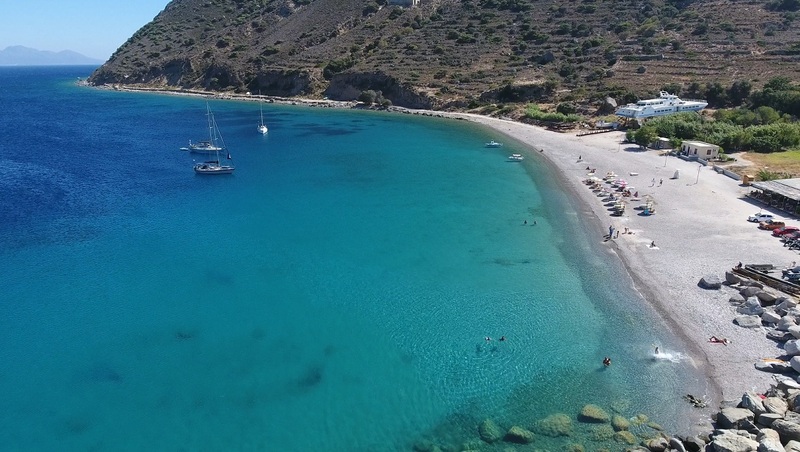 There are several beaches at Kamari and at the Kefalos cove like, Chrisi Akti, Polemi, Sandy Beach, Xirokampos, Laggades, Paradise, Camel, where you can enjoy sun bathing and swimming.